I'll let Fred answer about C124 & C125. I just followed his and George's lead on this. Maybe in my write up I mis-labeled them as 25v. THIS is why I wish we still had the *edit post* feature. If it is wrong I'll try to get a mod to correct it. Now that I can see their actual physical placement in H9's pics I could give more specific directions.:D. I'll be keeping a eye out for a 600 to add to my collection. Your very welcome,I'm glad I could help. Hey all! I have a question. In the power supply side, Is there a reason why you did not replace (C124 &C125) with 125uF 25v Panasonic FCs? No real advantage doing so and being as they are located ahead of the regulators and depending on the raw DC voltage the 25 volt rating may not be sufficient. Also, I see that these caps are listed as 35v and you replaced them with ones rated at 25v? 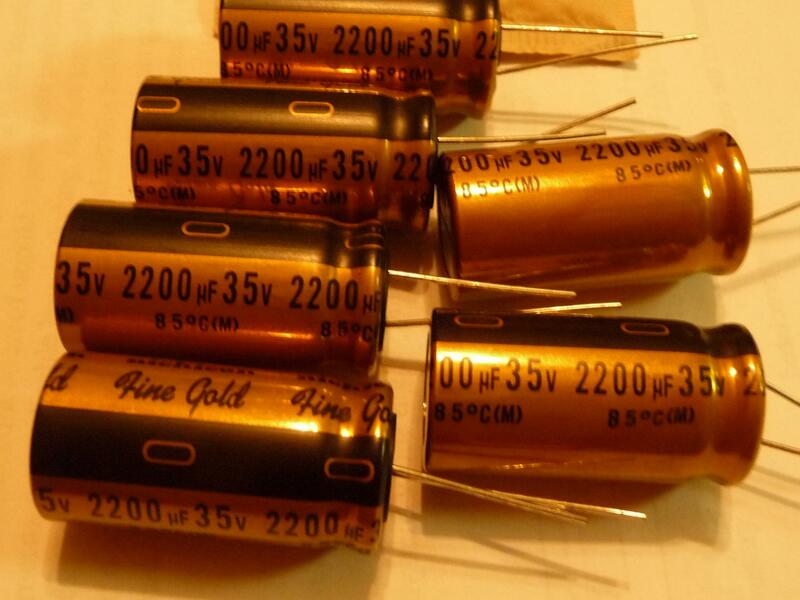 If you are refering to the 120 uf 25v caps that replaced the 10uf's, then the 25 volt rating is plenty as they are at the outputs of the 5 volt regulators. No real advantage doing so and being as they are located ahead of the regulators and depending on the raw DC voltage the 25 volt rating may not be sufficient.If you are refering to the 120 uf 25v caps that replaced the 10uf's, then the 25 volt rating is plenty as they are at the outputs of the 5 volt regulators. Oops,, gotta stay focused,, I'm looking for another one to mod,I'll keep you posted and add to the thread. Thats very generous of you George but if you find one go ahead and snag it.I have a number of other projects that I would like to try before tackling a 600. I haven't had a whole lot of time lately to critically listen, but the bass just seemed to come around a couple days ago. Initially it was a little lean and now it's full and extended. I am doing something an audiophile shouldn't do; I added new power cables to all my gear so who knows if it's a combination of cables and the dac mod or just one or the other. I probably realistically have about 30-40 hours on the dac mods. Wish I had an unmodded 600 to make a comparo. So who else has done this mod? I know have about 60-70 hours on the new parts. One word that comes to mind is hyper-detail. I'm not saying if that is a positive or negative, just very, very detailed. Not sure how I feel about it. I definitely wouldn't say it's analog sounding like the stock unit leaned. Again I need more listening time to formulate if it's too detailed. Not harsh, or fatiguing, etc. just very detailed. The sound stage has improved hugely in both depth and width and space around instruments is superb. Decay and attack has improved as well. Didn't you read the "We don't like Dave" thread? Hi . So you will let me borrow your 600 for a few weeks? Actually we were thinking in an upcoming RAS meet having a DAC listening session. The PS Audio, Stello, modded an unmodded Adcom's, LITE, etc. P.s. My prior post doesn't mean to imply that the mod isn't desirable, just putting some impressions out there. My impressions aren't fully formulated yet and may take a few months of listening for the final verdict. So far I LIKE what I hear. At just around 100 hours of break-in this thing has really settled in. It sounds fantastic. I can't get over the detail and soundstage is just huge. Bass extension is nice as well especially at lower levels. If you have one of these and have the skills this is really a no brainer and worth every penny. Ok, the final verdict is this modd is fu*king fantastic. My rig has never sounded better. Better dynamics, detail, bass, clarity, microdynamics and all still leaning towards the analog side of the scale. Biggest improvement has been the sound stage, noticeably deeper and wider as well as better delineation between instruments and vocals. Listening to Rod Stewart's - Stay w/ Me last night I kept hearing a cymbol crash way back in the mix behind the speakers.............never heard that before. Well, I've heard the crash before, but mostly in the same plane as the rest of the cymbol's. It's this kind of stuff, which you have to notice and listen for, where the largest improvements and enjoyment comes from for me. Highly, highly recommended. The work is a bit tedious because of the wave soldered board and smaller parts. But, with patience and some soldering knowledge and the proper tools it's not too bad. Just received the first batch of parts! FineGolds for the power supply and I'm going to try the Amtrans AMCH Series Film & Foil .pf caps for to replace the Wima (C545 & C542) Will prob do the same to (C553,C552) too. And then Sonicaps (Gen II) for (C561,C560,C544,C543, C540,C541) Oboy! Oboy! ... Will prob do the same to (C553,C552) too. The stock caps (C552,C553) used in the feedback loop of the I-V convertor appear in the posted pics to be ceramics.Upgrading this pair to films certainly won't hurt but I wouldn't expect big gains.IMO the Lions share of improvements comes from the use of a better opamp.Are you planning to use the OPA627 also? I took my mod a little further and removed coax 1 input inductor (L-200) and also replaced input coupling caps (C-220 and C-312). I am still scratching' my head in disbelief and enjoying the tunes. My Marantz SACD player doesn't get used much anymore. Brothers In Arms never sounded soooo good. Hey Kim, can you share more about what you did here? Did you remove (replace) the input caps or did you upgrade them to a different kind/size of cap. What was the idea behind removing the inductor/s since the signal is digital here? Can you post pics and more about your mods? 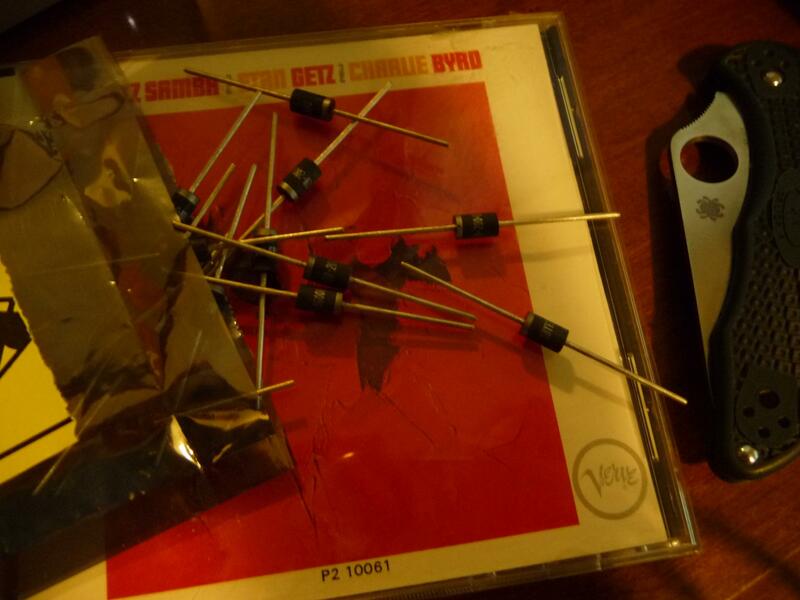 Vishay high speed soft recovery diodes arrived today! (P/N SBYV28-200 -E3/51) Yes I know 200v is overkill but it was the only value Mouser had ready to ship. The SBYV28s are suppose to be the hot setup. 20ns! So you're again going away from the plan? The hot set-up for what? You really should spend the bulk of your $$$ on the OPA627 that's where 90% (in my estimation) the improvement is. So far you haven't done that, but hey it's your project. You'll have to be abit creative installing these in the small foot print of the stock bridges.Are you adding small snubber caps across them? hmmm,, mine is dead quiet--can you post some pic's?Hopefully Mr Fred will chime in,,as he is the brains behind this mod. 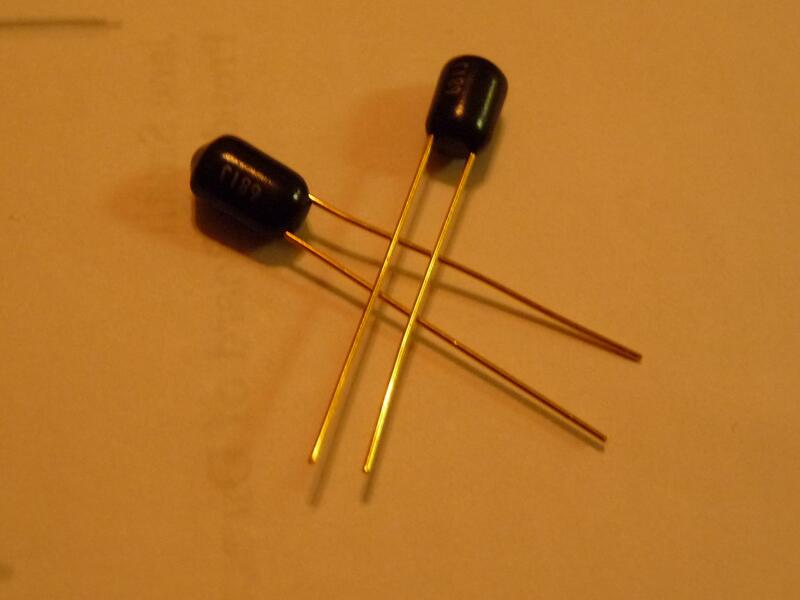 How did you ground the caps that you used on/with the opamps? This is curious... I don't think what you did to the power supply (1stage mod) should have any affect to the gain of the output. Unless, the new caps lowered the noise floor making it "seem" like a 6-9db improvement. So, the 60 cycle hum started after the 2nd stage mod? Both channels? Were there any washers that were moved or left out from the between the chassis posts that support the circuit board? Use a meter to see of you have A/C coming off the chassis. It must be some kind of grounding issue. I concur with dacboy that in all likelihood it is a ground issue.Also as he mentioned there should be no change in gain with any part of the mod,other than maybe apparent lowering of the noise floor.Did anything else in the system change at the same time you reinstalled the DAC.